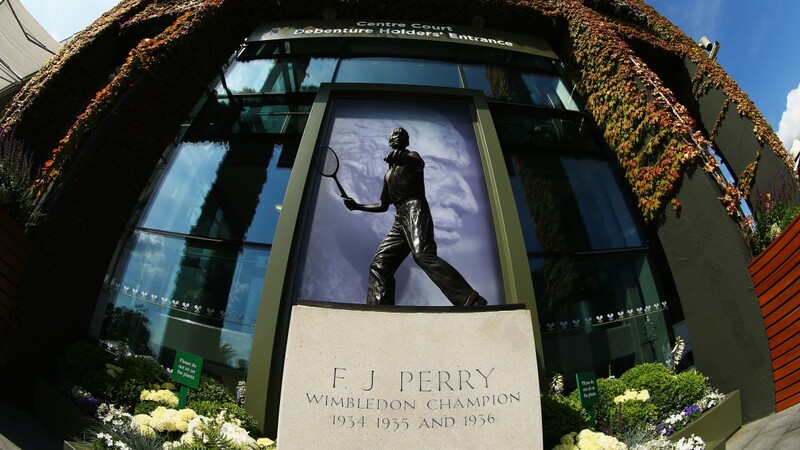 The statue of Fred Perry, the man who cast so large a shadow over Andy Murray for so long, is arresting because of its size: It stands on a giant pedestal, but it’s smaller than life. Perry was 6 feet tall; the statue can’t be more than 5. When he died, in 1995, it had been 59 years since a British man had won the final match on Centre Court. His ashes were buried beneath the statue at the All England Club, in a flowerbed filled with the official green, purple, and white. Two signs are placed in the shrubbery. They read the same thing: “Do not sit on the plants.” Winning never means what it should. He had been the avatar of a nation determined to be defeatist. He is still the object of obsession. “I’m not a tennis correspondent,” the tennis correspondent of one of Britain’s major papers drily said to me yesterday. “I’m an Andy Murray correspondent.” The British press still revolves around him, and the tabloids still dump on his head. Going into last year’s Wimbledon as the defending champion, just after England had been knocked out of the World Cup, Murray was asked what it felt like to “have the hopes of a despondent nation on [his] shoulders.” (“Wow,” Murray answered. “Wow.”) He lost in the quarterfinals. He’d been losing all year. Never mind that he was recovering from back surgery, adjusting to the new reality of being the Wimbledon titleholder, reeling from losing one coach, and beginning to push his game with another. By September, his ranking had sunk to no. 12, his lowest since May 2008; he had to scramble to get one of the eight spots in the tour finals, winning three titles in five weeks. Then, in those finals in London last November, he was dismantled by Roger Federer in less than an hour, 6-0, 6-1. The British fans leaned toward the Swiss side. Murray will never be Federer. Tomorrow, he will face Federer in the Wimbledon semifinals. It is an intriguing matchup. They are two of the game’s most skilled, innovative players, but they have contrasting strengths: Federer’s impeccable serve against Murray’s phenomenal return; Federer’s net approaches against Murray’s almost unparalleled passing shots. Centre Court will stand for both when they enter, and it will probably stand for whichever man wins. They adore Federer here. He is a seven-time Wimbledon champion, and he embodies what they want: tradition, elegance, gliding on grass. He is not British, of course, but he seems vaguely related, perhaps through the queen’s Saxe-Coburg line. There is no statue of Murray at the All England Club, but there is a kind of memorial to Federer; it’s the refurbished Centre Court. It suits Federer perfectly, everything about it: the surface, the name, the vibe, even the royal box (he’s always liked, as Anna Wintour once said, “a bit of flash”). The court’s new retractable roof practically seems built with him in mind. Like a Federer backhand, it has the complex grace of a Calatrava bridge, and it affects the court just the way he likes it. It was the closing of the roof during the 2012 Wimbledon final, after all, that helped Federer lift his game. Murray, who had started the match so impressively, was undone, and Federer went on to win, 4-6, 7-5, 6-3, 6-4. Murray’s style can be awkward. He plays with a grimace. He trudges from side to side. He still collapses for baffling stretches, grabs at his back, rants at his box, and stares at the sky with the forsaken look of Job. His forehand is ungainly, with his compact, closed-racket-face preparation, quick whip, and follow-through that often sweeps around his hips. But more and more, what stands out about his play is its intelligence. He turned the low point in London last fall into a turning point. Rejecting calls to fire his coach, Amelie Mauresmo, he parted ways with the rest of the team and went all in with her. By the time the Australian Open began, he was almost a different player; he made the finals there. By the time the French Open began, he was in full flight. There were still obvious liabilities — the weak second serve, the stretches of raging despair — but his game had become more flexible and more daring. It is conventional to say he grinds points out, but that’s not quite fair. He runs down every dying drop shot, but it’s the flicked response on a sprint rather than the flat-out effort that impresses me most now. He can switch spins, angles, and speeds several times within a single point. In his quarterfinal win over Pospisil — a big server who moves and volleys well — Murray hit every kind of ball. He dominated the long rallies (Murray won 16 of 21 points that went longer than nine shots) by breaking them into smaller events, creating chances out of defensive shots. At 5-4, 30-15, he hit a lob I would have called lucky and desperate — except that, with his next shot, he hit the lob again. There were crisp backhands, soft slices, overheads hit while leaping back. Every ball he hit was a move, and every movement set up the next shot. At a few points, he hit his forehand with such force that Pospisil stumbled back. On Friday, Murray will be playing in his 17th major semifinal — four more, as it happens, than Perry. But even if he wins Wimbledon again, Murray will never be able to prove himself enough. And he will never not need something to prove. Shaun Botterill/Getty Images Amelie Mauresmo talks to Andy Murray during practice. Murray’s wariness has become independence. He is older now — 28, somewhere between a player’s prime and his winter. The lines of his face are cut deeper, and the wild heath of his hair is starting to thin on top. He’s married now, to a beautiful woman with a salty mouth. (“Marriage works,” he scrawled across the camera lens after beating Rafa Nadal in Madrid.) He has a fantastic, sardonic sense of humor, and some pretty great dogs. He is still learning how to handle his emotions, still growing in various ways. He has made good, difficult choices, and he has defended them. The experience of working with Mauresmo changed him. 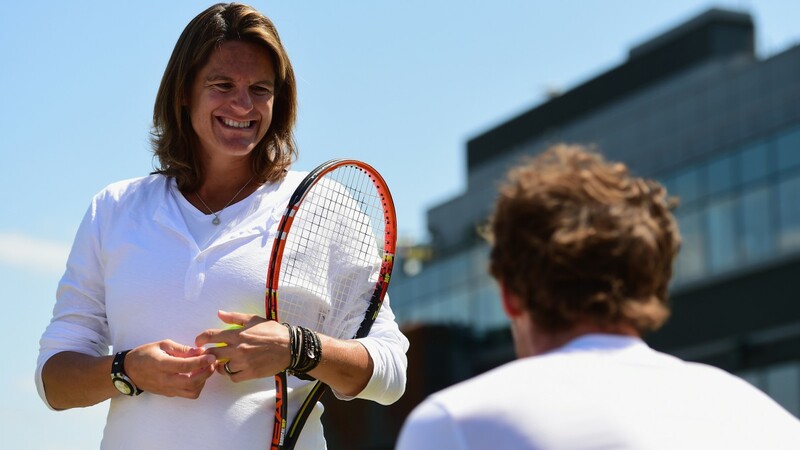 He started to notice how few female coaches there were in any sport — which was inexplicable, considering all the strengths Mauresmo had been able to bring to him. And he heard what people said about her, how much she’d confused him, how little she’d inspired him, how far she’d led him astray. “The staggering thing was that she was slated every time I lost,” he wrote on his blog, “which is something my former coaches never, ever experienced.” The magazine Red Bulletin asked if he considered himself a feminist. He paused. “Good question. I don’t know. I’m pro everyone being equal,” he answered, “and if that’s being a feminist then you could say so, yes. It really opened my eyes when I started working with Amelie.” In June, he asked himself the same question on his blog — then dropped the “I don’t know.” The rest of his answer was the same. Mauresmo will be in Murray’s box on Friday, alongside Jonas Bjorkman, who will take over her duties when she leaves to give birth later this summer. Bjorkman is a three-time Wimbledon doubles champion, and he has been working with Murray on his return and court positioning at net. There is always something to improve, always something to learn. Murray studies his opponents, he mentors younger players. He watches tennis in his free time for fun, something many players don’t do. He seems to love the game. Watching Murray moan on the court and spar with the press used to make me wonder why he bothered to play. He seemed miserable, as if stooped under the weight of some unbearable obligation. I’d hoped winning Wimbledon would release him. The All England Club would have another statue to put in his place. But I was wrong — wrong about the pressure, and wrong about Murray. Winning doesn’t mean what it should. But Murray made it mean what it could.